Queen of England, Scotland and Ireland reigned from 1702-1714. Under the Acts of Union, two of her realms, the kingdoms of England and Scotland, united as a single sovereign state known as Great Britain. Document signed “Anne R”. 13.5 x 9.25 inch, Court at Windsor, 1709 August 2. Rare military commission on vellum signed by Queen Anne appointing John Lloyd, Ensign to be a Captain in the Regiment of Foot commanded by Archibald, Earl of Ilay. It is lacking the seal but retains the pale blue revenue stamp affixed in the left margin. Soiled and some stains, signature light, but legible. Archibald Campbell (1682-1761) 3rd Duke of Argyll, Earl of Ilay (from 1706) was a Scottish nobleman, politician and soldier and was one of the founders of the Royal Bank of Scotland. It is countersigned at the bottom by Henry Boyle (1669-1725) 1st Baron Carleton. Anglo-Irish Politician, Lord Treasurer of Ireland 1704-15 and Northern Secretary. King of Spain who ascended the throne in 1975, two days after the death of Francisco Franco and oversaw the troubled nation’s transition to a constitutional monarchy. Individually signed Christmas greetings card “Juan Carlos” + “Sofia” as Prince and Princess. 5.0 x 6.75 inch (folded), n.p., 1967. 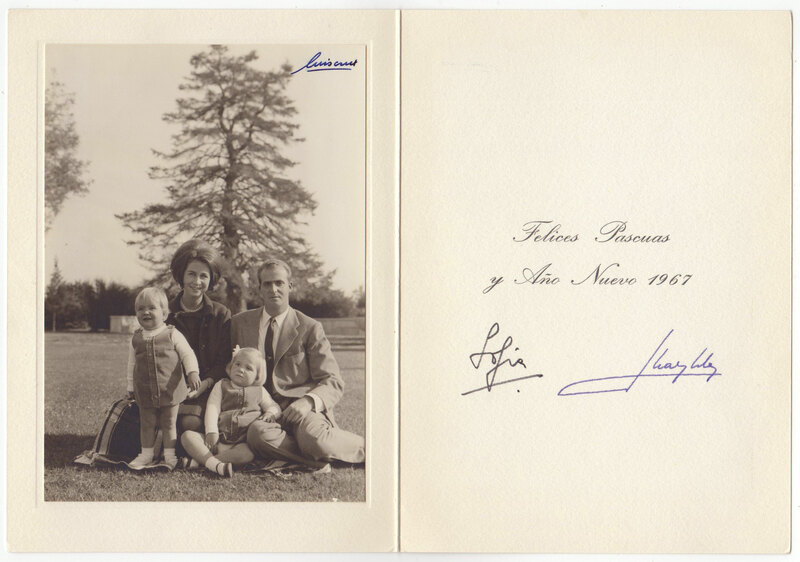 To the inside of the folding stiff white card, featuring a photograph of Prince Juan Carlos and Princess Sofia outdoors with their two daughters, Elena and Cristina. Signed in bold dark ink beneath a printed greeting in Spanish. To the front card bearing a golden embossed crown. Fine condition. King of Spain who ascended the throne in 1975, two days after the death of Francisco Franco and oversaw the troubled nation’s transition to a constitutional monarchy. Individually signed Christmas greetings card “Juan Carlos” + “Sofia” as Prince and Princess. 6.75 x 4.75 inch (folded), n.p., 1974. To the inside of the folding stiff white card, featuring a color photograph of their three children, Elena, Cristina and Felipe, riding their bicycles at their home´s garden. Signed in bold black ink beneath a printed greeting in Spanish. To the front card bearing a golden embossed monogram with a coat of arms. Accompanied by the original envelope. Fine condition. Felipe VI. (1968) King of Spain since 2014 following the abdication of his father King Juan Carlos I.
Charles, Prince of Wales, the eldest child and heir apparent of Queen Elizabeth II. Diana, first wife of Charles, Prince of Wales. From her engagement to the Prince of Wales in 1981 until her tragic death in 1997, Diana was a major presence on the world stage, often described as the "world's most photographed woman” or “The Queen of hearts”. Presentation photograph, signed and dated in ink “Charles 1987” by Charles and signed in ink “Diana” by Diana. 5.25 x 7.0 inch visible photograph and 7.0 x 9.5 inch framed, n.p. (London), 1987. Original green morocco presentation stand-frame by Andrew Soos of London which has the Prince of Wales feathers embossed in silver on the front at the top. Photo shows Charles and Diana with Prince William and Prince Harry in the gardens of Highgrove. Frame shows only very minor handling wear, but is in near fine condition. Photograph is in fine condition, signatures a little faded. A highly desirable and rare autograph. Typed letter signed regarding the “wedding of the century"
Charles, Prince of Wales, the eldest child and heir apparent of Queen Elizabeth II. Diana, first wife of Charles, Prince of Wales. From her engagement to the Prince of Wales in 1981 until her tragic death in 1997, Diana was a major presence on the world stage, often described as the "world's most photographed woman” or “The Queen of hearts”. Typed letter signed “Charles” and “Yours most sincerely, and Diana”. 1p., 8.0 x 12.75 inch, embossed Buckingham Palace letterhead, 1981, October 7. The royal couple write to Miss Endruweit. In full: “We would both like to thank you very much indeed for your most kind contribution to the wedding present which the Duchy has given us. We really are delighted with the mahogany library table which will look splendid in our home at Highgrove and is exactly the right period for the house. We were also most touched to receive the balance of the gift in the form of a cheque with which we shall probably buy some more furniture. As you can well imagine, with two houses to equip from scratch we have quite a difficult task ahead of us! We have been completely overwhelmed by the kindness and generosity which so many people have shown to us, but, as you will know we have a very special affection for the Duchy and all those who live and work in it and we therefore particularly appreciate your gift. We look forward very much to visiting the Duchy together in the future.” Accompanied by the original mailing envelope. In fine condition. The fabled royal wedding took place at St. Paul’s Cathedral on July 29, 1981, before an invited congregation of 3,500 and an estimated worldwide television audience of 750 million. A handsome and personal souvenir of one of the most storied “public” marriages in modern history! Charles, Prince of Wales, the eldest child and heir apparent of Queen Elizabeth II. Typed letter signed “Yours sincerely Charles” and additionally in his hand “Dear Mr. Todd”. 1p., 8.0 x 12.0 inch, 1990 January 12. On embossed “Kensington Palace” stationery. In part: “It was very good of you to take the trouble to make a return visit and I was interested to hear your views about the future for Blackburn. I am sure you are also right about the need for the ordnance factory to investigate diversifying its production, particularly in view of all the current international changes that are taking place, apart from any other consideration.” Mailing folds, minor handling wear, else fine condition. Charles, Prince of Wales, the eldest child and heir apparent of Queen Elizabeth II. Signed Christmas card, 15.75 x 6.0 inch (unfolded), no place (London), n.d. (2004). Signed in black ink “Darren from Charles”. The card is thick white board with gilded royal crest to front and features a photograph of Prince Charles, William & Harry. The picture is a stylish Black & White form with the three Princes. Also included is the original gift a beautiful Halcyon Days Enamel Pill Box. The Pill Box depicts the Castle Of Mey and inscribed to the inside “Christmas 2004”. Near mint condition. Card & accompanying gift were received by his personal staff. One of a kind items and the first time that I have the card and gift together for sale. Charles, Prince of Wales, the eldest child and heir apparent of Queen Elizabeth II. Signed Christmas card, 9.5 x 7.25 inch (unfolded), no place (London), n.d. (1977). Signed in blue ink “Mr. and Mrs. Christopher – from Charles”. Inside fine original photo of Charles in native Canadian dress and in his hand underneath his image “CANADA 1977.” Gold embossed Prince of Wales monogram on the front. Two minor stains, else fine condition. Provenance: Mr. Christopher who was the head gamekeeper at Prince Charles Sandringham Estate until his recent death. Charles, Prince of Wales, the eldest child and heir apparent of Queen Elizabeth II. Signed Christmas card, 11.75 x 8.0 inch (unfolded), no place (London), n.d. (1997). Signed in black ink “Sylvie – from Charles”. Inside fine original photo of Charles with his two sons. Gold embossed Prince of Wales monogram on the front. Fine condition. First wife of Charles, Prince of Wales. From her engagement to the Prince of Wales in 1981 until her tragic death in 1997, Diana was a major presence on the world stage, often described as the "world's most photographed woman” or “The Queen of hearts”. Beautiful Royal Christmas card for 1994 signed by Princess Diana ("from Diana") to “Mr. Somerville,” (written in Diana’s hand at the top). 8.0 x 6.0 inch folded. Mounted sepia toned photograph of Diana with her two young sons, Princes William and Harry, gold embossed monogram on the front. In near mint condition. From the Estate of Mr. Philip Somerville (1930-2014). Somerville was one of Queen Elizabeth’s milliners from the early 1980s until he retired in 2008. His hats were also favored by Lady Diana and members of several European royal families. King of the United Kingdom and the British Dominions and Emperor of India from 22 January 1901 until his death. 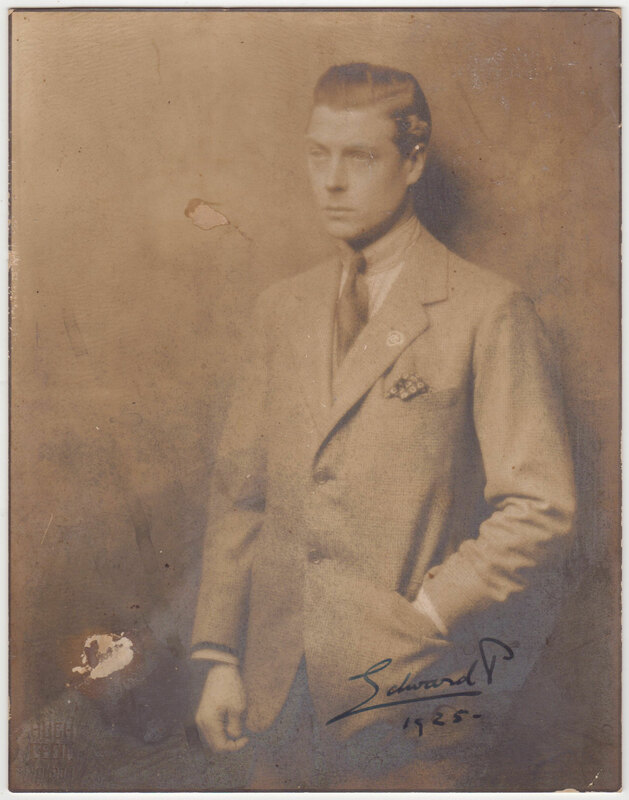 Vintage signed sepia photograph “Edward R”. 8.0 x 10.25 inch, Cowes 1904. The image depicting the King standing in a three quarter length pose wearing his naval uniform and cap. Signed in bold, dark fountain pen ink to the lower photographer's mount and dated “Cowes – 1904” in his hand. Neatly trimmed to the edges of the photographer's mount and with some light discoloration, the image lightly faded, else good condition. Uncommon signed photo, especially as King. King of the United Kingdom and the British Dominions and Emperor of India from 22 January 1901 until his death. Letter signed “Albert EdwardP”. 3pp. (double-page), written on page one, page two and three inside. 7.25 x 9.0 inch, London, "Marlborough House", 1886 November 12. As Prince of Wales to the "Chairman of the Urban Sanitary Authority of Benfieldside" concerning the preparations for the "Golden Jubilee" of Queen Victoria the following year. In full: "...I have no doubt that your attention has been drawn to the correspondence which has recently passed between the Lord Mayor of London and myself on the subject of the formation of an Imperial Institution of the Colonies and India in commemoration of Her Majesty's Jubilee by her subjects and to the opening of a Central Fund at the Mansion House in London for the receipt of contributions from the various parts of the Empire towards this object. As I am convinced that the anxiety to commemorate in some special manner Her Majesty's Jubilee is felt as warmly in the Provincial Cities and Towns of the United Kingdom as in any portion of the Queen's Dominions, I am desirous of inviting the cooperation of Mayors, Provosts, and Chairmen of Sanitary Boards in bringing this proposal prominently to the knowledge of their fellow townsmen, and in taking such practical steps, by the convening of meetings, the formation of local committees, and the opening of local subscription lists as may be desirable on necessary in aid of the Central Fund. It will give me much satisfaction to hear that I may count upon your personal assistance in the matter, and to learn from time to time how the fund is progressing ..." Slightly discolored, mounting residue on verso, minor fold break, else good condition. King of the United Kingdom and the Dominions of the British Empire, and Emperor of India, from 20 January 1936 until his abdication on 11 December the same year. Very rare document signed as King “Edward RI”. 1p., 12.5 x 15.25 inch, 1936 June 23. Appointing Walter Robert Ludlow a knight commander. Signed to the top left corner by the King as “Edward R(ex) I(mperator). Countersigned by Arthur, Duke of Connaught (1850-1942) - a member of the British Royal Family as the seventh child and third son of Queen Victoria and Prince Albert. Document is mounted to thick board and slightly faded due to previous display but still very clear. An extremely rare document and signature due the kings very short reign of less than a year. King of the United Kingdom and the Dominions of the British Empire, and Emperor of India, from 20 January 1936 until his abdication on 11 December the same year. Autographed note signed “Edward”. 1p., 5.0 x 7.0 inch. N.p. 1951. Blue embossed crest at the top. In full: “To Doris and Archibald McNicol with best wishes from Edward Christmas 1951”. Handling wear, mounting residue on verso, else good condition. Princess Palatine Elisabeth Charlotte was a German princess and, as Madame, the wife of Philippe I, Duke of Orléans, younger brother of Louis XIV. of France. Final page of an autographed letter signed "Elisabeth Charlotte". 1p. (double-page), 7.0 x 9.25 inch. (Versailles, 1719 March 19). The final page of one of the famous letters to her half-sister Louise von Degenfeld (1661-1733) in Hannover. In German, in full: "so seindt die beichtsvätter Eben so partiallisch undt voller politic alß andere, undt Man kan von hir Nun sagen, wie zur zeitten der Sündtfluth alles fleisch hatt seinen weg verkehrt, die beichts vatter denken Nur ahn politic, undt, waß die menschen nicht Vor sündt halten sagt Man den beichtsvattern nicht von dießem allem wollen wir biß Donnerstag ferner sprechen Nun kompt Mons Teray undt will mich zu bett, Muß also vor dieß mahl wider willen schließen und nichts mehr sagen alß daß Ich Euch Liebe Louise Von Hertzen lieb behalte". The full letter is printed in the issue of the "letters", edited by W. L. Holland, Nr. 1002. Mailing folds, slightly discolored, else fine condition. Queen of the United Kingdom since 1952. Prince Philip, Duke of Edinburgh, husband of Queen Elizabeth II. Signed photograph “Elizabeth R 1954” and “Philip”. 6.0 x 8.0 inch black and white photo on a 7.5 x 9.75 inch photographers mount and mounted inside a slightly larger original presentation folder, n.p. (London), 1954. Signed in dark black ink on the photographers mount below the photograph. Photo comes from Mr. Jules Henry Joelin of Emile Limited on Sloane Street, her hairdresser for over thirty years - 1939-1969. Accompanied by an original envelope sent Registered from Buckingham Palace, but postmarked 21st December 1953. The photo fits perfectly in the envelope, envelope was probably reversed in later years. Handling and corner wear, slightly discolored, signatures fine. Excellent provenance. Queen of the United Kingdom since 1952. Document signed “Elizabeth R”. 21.0 x 16.5 inch, Court of Saint James’s, 1955 August 17. Appointment for Ronald Agnew Finlay as Consul for the Spanish possessions in the Gulf of Guinea and Fernando Po and its dependencies. Countersigned by later Prime Minister Harold Macmillan (1894-1986) as Foreign Secretary. Mailing folds, light show through of an official stamp on verso, minor handling wear, else fine condition. Item was directly acquired from a descendant of Ronald Agnew Finlay. Ronald Agnew Finlay was born in 1901 in Glasgow, Scotland and died there in 1974. He was lucky enough to be born just too late to fight in WWI and went to University instead. According to family stories he joined the Foreign Office after graduation, he was a polyglot, being able to speak six languages and they say that he was sent to spy in various countries, especially China during the Manchurian Incident. A document with fine history on the market the first time. Queen of the United Kingdom since 1952. Document signed “Elizabeth R”. 21.0 x 16.5 inch, Court of Saint James’s, 1955 August 17. Appointment for Ronald Agnew Finlay as Consul for the Trust Territory of the Cameroons under French administration, to reside at Duala. Countersigned by later Prime Minister Harold Macmillan (1894-1986) as Foreign Secretary. Mailing folds, light show through of an official stamp on verso, minor handling wear, else fine condition. Item was directly acquired from a descendant of Ronald Agnew Finlay. Ronald Agnew Finlay was born in 1901 in Glasgow, Scotland and died there in 1974. He was lucky enough to be born just too late to fight in WWI and went to University instead. According to family stories he joined the Foreign Office after graduation, he was a polyglot, being able to speak six languages and they say that he was sent to spy in various countries, especially China during the Manchurian Incident. A document with fine history on the market the first time. Queen of the United Kingdom since 1952. Document signed “Elizabeth R”. 16.25 x 13.0 inch, Court of Saint James’s, 1956 March 1. Warrant approving the appointment of “Monsieur Othon Goetz to be Consul at Nairobi, for the Colony and Protectorade of Kenya, the Protectorate of Uganda and the Seychelles Islands”. Countersigned by Selwyn Lloyd (1904-1978) as Foreign Secretary. Mailing folds, minor handling wear, else good condition. Queen of the United Kingdom since 1952. Document signed “Elizabeth R”. 16.0 x 13.25 inch, Court of Saint James’s, 1956 March 13. Appointment for Eric Lionel Jeffries as Second Lieutenant of the Territorial Army. Countersigned by General Sir Cameron Gordon Graham Nicholson (1898-1979) as aide-de-camp general of the Queen and with a second unknown countersignature. Folds in the middle, mounting residue on verso, signatures slightly faded but still good legible. Queen of the United Kingdom since 1952. Excellent signature “Elizabeth R”. 8.5 x 6.0 inch, n.p., n.d. Visitors book signed by the Queen in dark black ink. Blue hardcover, only one page of the book is signed, page three by the Queen. Mint condition. Elizabeth Angela Marguerite Bowes-Lyon was the wife of King George VI. and the mother of Queen Elizabeth II. and Princess Margaret. She was Queen consort of the United Kingdom and the Dominions from her husband's accession in 1936 until his death in 1952, after which she was known as Queen Elizabeth - The Queen Mother. Princess Margaret, Countess of Snowdon was the younger daughter of King George VI. and Queen Elizabeth. Document “Signed on behalf of her Majesty The Queen”. Signed in black ink “Elizabeth R” and in blue ink “Margaret”. 21.0 x 16.5 inch, Court of Saint James’s, 1959 July 22. The Queen (Elizabeth II.) could not sign the document herself because she was on a state visit to Canada at that time. Appointment for Ronald Agnew Finlay as Consul for the Netherlands Antilles and Surinam, to reside at Willemstad. Countersigned by Selwyn Lloyd (1904-1978) as Foreign Secretary. Mailing folds, minor handling wear, else fine condition. Item was directly acquired from a descendant of Ronald Agnew Finlay. Ronald Agnew Finlay was born in 1901 in Glasgow, Scotland and died there in 1974. He was lucky enough to be born just too late to fight in WWI and went to University instead. According to family stories he joined the Foreign Office after graduation, he was a polyglot, being able to speak six languages and they say that he was sent to spy in various countries, especially China during the Manchurian Incident. A document with fine history on the market the first time.